I saw an advert on tv the other day. It was a bed company telling us that they recommend that people should change their mattress every eight years. Well, they would say that, wouldn't they? Yet, the first bed I remember buying had a guarantee of ten years. What conclusion is to be drawn here? Are new mattresses inferior in quality to those of 30 odd years ago? Or are bed companies just trying to force us into buying their wares when we don't really need to? Here's a question. How do you pronounce the word mattress? Is it MATTress, or is it mattRESS? I have always put the emphasis on the first part of the word, but I've heard a few people emphasising the second part. Surely that's not right. Am I just being pedantic? Pronounced pedANtic not PEDantic. Anyway, about five years ago Mrs G and I decided we needed a new bed. Given that we spend a good third of our existence in a bed, we thought we should buy one of reasonable quality. We spent quite a large sum on our new bed. I won't tell you what we spent, but I will tell you that whoever we told at the time gave the same reaction... You spent how much??? On a bed??? You must be off your rockers! Suffice to say, it was expensive. Very. At that time, the most popular type of mattress had a 'topper' of 'memory foam'. This is the type our pricy new bed had. The idea is sound; the mattress would conform to your body shape. Thus, it would be ideally suited to your shape and your shape alone. With me so far? Unfortunately, memory foam is easy to confuse. Yes, it shapes itself around you, which is fine if you lie in the exact same position every time you go to bed. But who can do that? Most people turn quite a bit during the night. Thus the shape that the memory foam assumes is a dirty great hollow. Not too good for me with chronic back pain which means, every time I get into said bed with the valley in it, I get sciatica down my legs which, no matter what position I am in, stops me sleeping. Oooh. I’m a martyr to sciatica, me. Every night it’s the same. Well, not exactly the same. It shifts about a bit. One night left leg. Another, it’s the right leg. Then there are nights when it starts in my left leg and moves to my right. Or the other way about. It’s not fussy. Other times I get it in both legs. Wahey! Double the agony... but I don’t like to mention it. Any road up, after only five years Mrs G and I are looking at buying another new bed. Guess what. The shop we went to doesn't sell beds with memory foam toppers any more. I wonder why not. All this (g)rambling about mattresses reminds me of my favorite mattress related joke. Come to think of it, it is the only mattress related joke I know. A fellow was carrying an old flock mattress to the dump when he met a friend. 'Where are you going with that?' enquires the friend. A few days later, the friend sees him again. This time, he is carrying the flock mattress as if heading home. Boom and, as it were, tish! The biggest football story of the week has to be the sacking of Leicester City manager Claudio Ranieri. How fickle the world of football is. This time last year, he was hailed as the greatest manager in the world. He had brought a team up from the second tier and within two seasons they won the Premiershit title under his guidance. Now, just nine (admittedly difficult) months later, he’s been given his jotters. There are just 13 games left to play in the league this season and Leicester currently sit just one point above the relegation zone; now is not the time to bring in a new manager. The Grambler’s view? Big, big mistake. Were any famous or notorious people born on the 25th of February? Of course. Here are some I’ve even heard of. Thomas Newcomen 1664 (Ironmonger who built the first practical steam engine. ), Auguste Renoir 1841 (French impressionist. Probably did people like Sarah Bernhardt... Well, Tommy Cooper and Frank Spencer weren’t around in those days. ), Enrico Caruso 1873 (Top tenor of his day. Between 1900 and his death in 1921 he made more than 260 recordings. Here is your first link of the week: your actual Caruso. These are the earliest known recordings and the quality isn’t bad considering they were made in 1900-01. ), Tom Crean 1877 (Who? He was an Antarctic explorer who served on Robert Scott’s ships Discovery and Terra Nova and also on Ernest Shackleton’s Endurance. ), Myra Hess 1890 (Tickler of the ivories. ), Meher Baba 1894 (Indian spiritual master. Took a vow of silence in 1925 which lasted until his death in 1969. ), Herbert Marx 1901 (Who? Known by his stage name of Zeppo, he was the fourth Marx Brother who played the straight role in the five earliest films. He left in 1933 to embark on a career as an engineer and theatrical agent. He died a multi-millionaire. ), Jim Backus 1913 (The voice of Mr Magoo. ), Gert Frobe 1913 (Cherman ector. Played Goldfinger. Didn’t actually say 'No, Mr Bond, I expect you to die.' His voice was dubbed by English actor, Michael Collins. ), John Arlott 1914 (Cricket commentator famous for a slow delivery but a quick wit... ‘He played a cut so late as to be positively posthumous’. ), Anthony Burgess 1917 (Author. A Clockwork Orange was his most famous work. ), Larry Gelbart 1928 (Creator of the TV series M.A.S.H. ), Tony Brooks 1932 (Racey car bloke. ), Faron Young 1932 (Singer. Only had one hit in UK. All together now... It's four in the morning . ), Tom Courtenay 1937 (Ectaw. Billy Liar. That was him. ), Herb Elliott 1938 (Strine Ranny blake. ), Farokh Engineer 1938 (Not an engineer but a crickety bloke. ), David Puttnam 1941 (Film producer. Chariots of Fire. That was one of his. ), George Harrison 1943 (The quiet one of the Fab Four. If you have been a regular reader of this blog, you are probably aware that I always thought his work within the Beatles was underrated. I was going to put a link in at this point, but it is pretty much impossible to get any Beatles’ stuff on line. Instead, here is Steve Hillage performing a George Harrison toon. All together now... It's all too much. ), Francois Cevert 1944 (Another racey car bloke. ), Neil Jordan 1950 (Oirish fillum doirector, screenwroiter, novellist and short story wroiter... in fact, a roight owld smarty boots. ), Don Quarrie 1951 (Jamaican runny bloke. ), Mike Peters 1959 (Welsh singer. Remember the Alarm? No, I’m not reminding you to set the alarm clock. It was a band. They had a hit. They did and all. This one. Love those 80s hairstyles. ), Lee Evans 1964 (Retired comedian. Honest. He retired in 2015. He had been one of the highest-paid comedians at his peak. I went to see him live back in the 80s before he was famous. He was the support act for Bing Hitler. Bing Hitler? Whatever happened to him, eh? [Er, you mean Craig Ferguson who hosts the Late Late Show in the US with a salary in the region of $8.5 million and is worth an estimated $30 million? Yeah, whatever happened to him? - Ed.]) and Ed Balls 1967 (Unfortunate place to have them.). 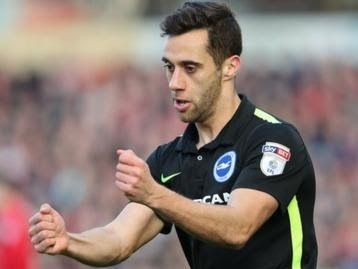 Brighton returned to the top of the Championship as Sam Baldock's two goals gave them victory at Barnsley in Chris Hughton's 100th league game in charge. Striker Baldock struck a superb half-volley over Tykes goalkeeper Adam Davies early in the second half before slotting home Anthony Knockaert's pass. After a goalless first period, the away side almost went in front three minutes into the second half when Chris Lines' charging run left him with only Leonardo Fasan to beat, but he fired just wide from a tight angle. Vale then took the lead on 54 minutes when ‘Whispering’ Bob Harris attempted to clear Kiko's low cross, but he only succeeded in slicing the ball past his own keeper. But Rovers were level on 78 minutes when Billy Bodin worked himself some space on the edge of the Vale box before firing an unstoppable shot past Fasan into the top left corner. Vale almost snatched a 90th-minute winner when Callum Guy latched onto a through ball, but he could not lift the ball over Joe ‘Ann’ Lumley. Portsmouth had Conor ‘Charlie’ Chaplin's late strike to thank for earning a draw away against Barnet. Both sides looked out of sorts as passes repeatedly went astray in the opening exchanges. Pompey eventually had the first effort on goal, Eoin ‘Mrs’ Doyle heading wide from eight yards, while Curtis Weston met Mauro Vilhete's cross just after the half-hour mark to force David Forde into a sharp save at the other end. Portsmouth boss Paul Cook brought on Chaplin and ‘Broadway’ Danny Rose at the break but the Bees almost went ahead after an hour as Ruben Bover's free-kick clipped the side-netting. The Spaniard had gone off when Barnet won another set-piece in a similar position but Vilhete deputised brilliantly, bending the ball over the wall to give the Bees an 82nd-minute lead. However, the home side could not hang on as Chaplin fired a dramatic equaliser into the top corner from 20 yards in the 89th minute. Matty Kennedy's stunning strike rescued a point for promotion-chasing Plymouth at Hartlepool. Kennedy curled the ball home from outside the area with 14 minutes remaining to cancel out Rhys Oates' strike as second-placed Argyle, three points off leaders Doncaster going into the game, took a share of the spoils. Plymouth began like a side pushing for the title, with Ryan Taylor and Jake Jervis testing young goalkeeper Joe Fryer in the opening exchanges. Yet Pools grew into the game and took the lead midway through the opening period, Oates powering the ball into an empty net after Luke McCormick had denied Nathan Thomas. The hosts controlled proceedings thereafter, with Plymouth growing increasingly frustrated. Kennedy was Argyle's biggest threat, jinking his way past Kenton Richardson and firing over as the game entered the last 15 minutes. But he made no mistake moments later as he cut inside from the left and curled a stunning 20-yard effort past Fryer. Not such a whopping amount to (not) win this week. Teaser time. Yay! Last week I asked you which goalkeeper has kept the most Premier League clean sheets. The answer is Petr Cech who in 392 Premiershit appearances has kept 186 clean sheets. Not only that, of the 14 goalkeepers who have had over 100 shutouts, he has the best average of 48 per cent. The next best average was Pepe Reina who in 285 appearances for Liverpool kept 134 clean sheets or 46 per cent. One for this week? How about a question on the European Cup/Champions league? It is regarding highest goalscorers in the competitions. Which German has been the highest goalscorer in four separate years? A nice easy one there. And finally, Cyril? And finally Esther, I am indebted to a Mr H. (or should that be Z?) Marx. I wanted to end with an amusing moment from one of the Marx Brothers films. Especially one which featured Zeppo. Do you know what? There are very few. This six-second long clip is labelled as Zeppo's best joke. Hmm.